Its Our County organise area clean up. 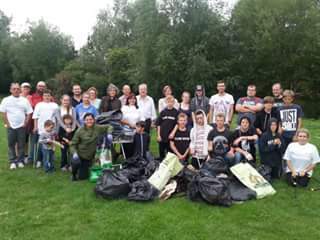 Its our County members and volunteers, who were fed up of complaining about the state of their walkway in Herefordshire, were out on Thursday night cleaning up the rubbish themselves. Ward councillors around Yazor Brook also helped the community effort after receiving complaints of drug needles and broken glass caused by smashed bottles of alcohol. Herefordshire Council say offensive graffiti has been cleaned up and weekly litter picks do happen in the areas owned by them. http://www.itsourcounty.org/wp-content/uploads/2016/02/Yazer-Brook.jpg 240 320 PaulNeades http://www.itsourcounty.org/wp-content/uploads/2019/02/IOC-crop-Colour-1.jpg PaulNeades2015-08-21 17:13:392016-02-11 17:19:46Its Our County organise area clean up.